Oh Snap! The Friggin Amazing J.Ho Sketchblog...: Face it jackpot, you just hit the tiger! 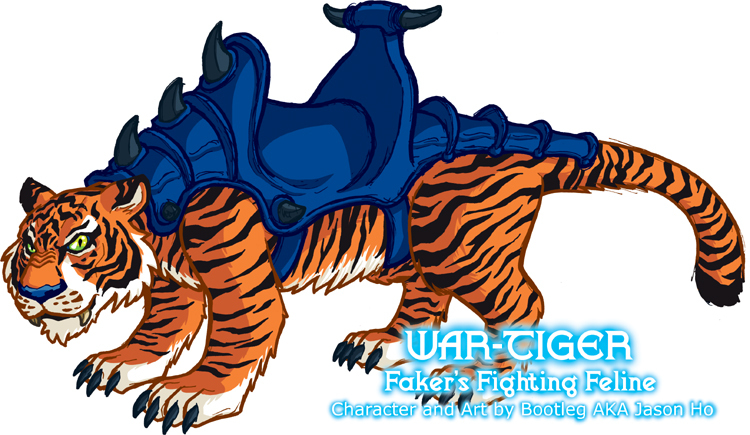 War-Tiger is, of course, just a re-color and slight tweaking of He-Man's fearless friend, Battle Cat. After I decided to give Faker a similar pet, natural colors seemed like a fitting contrast to Battle Cat's outlandish pelt. I'm satisfied with the overall results of this illustration--particularly with the way War-Tiger's color scheme matches Faker (see my version here, if you missed it). Sometime after I came up with this idea, I came across a picture of a bootleg (heh) He-Man toy that came with a yellow tiger Battle Cat in Red Armor--a picture of the item in question is linked in this post. Eventually I'm going to have to come up with a name and backstory for that version too! PROFILE: WAR-TIGER is a terran tiger of unusual size, power, and intelligence, as a result of specially prepared treatments administered to him by Skeletor himself. He and Faker apparently share a limited psychic bond, which Skeletor and Evil-Lyn can find no explanation for. Unlike Battle Cat, War-Tiger cannot speak, though it is clear that he can understand Faker's commands. HISTORY: When Skeletor's inner circle travelled to Earth in an attempted negotiation with Carnivor's Aracnos forces, Faker was separated from his party, and stumbled across an orphaned tiger cub. Faker found his way back to his allies, but the negotiations went poorly, and all-out hostilities were narrowly averted. However, Faker's skill in combat and empathy for his newfound pet earned the deep respect of Felinor, General of the Aracnos Earth division. Since being brought to Eternia, War-Tiger has been raised to adulthood by Faker, and the pair has clashed several times with Battle Cat and He-Man.